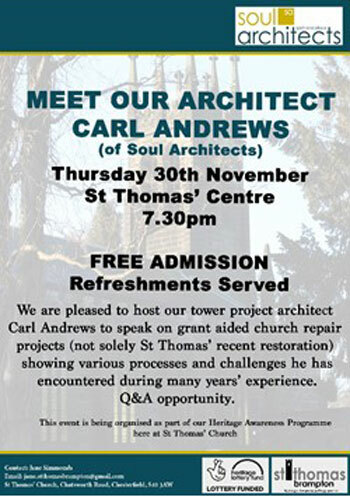 I was very impressed by the turn out for the talk that I gave at St Thomas’ Church this week – considering it was the first sign of snow and the wind was biting – in fact more than a couple of people who turned up had said they were thinking should they or shouldn’t they, but were pleased that they had! The talk highlighted some of the challenges we’ve faced on some of our projects and how we overcame them. I’ve said many a time with historic building projects that you never really know what you’re going to get! Historic buildings do present challenges and working with them over a number of years I have learnt to expect the unexpected and think on my feet! You cannot underestimate the importance of the investigation works, but sometimes you just can’t prepare for every situation – it’s about how you deal with it that counts – no two days or projects are the same and coming from a technical background, I embrace the challenges that technical problems present. Not many people may know that I was an architectural technologists before becoming an architect, so I am lucky to have that experience behind me when dealing with technical issues, which goes way beyond the design! I understand the complexities of working with existing buildings and the need to be flexible and being conservation accredited, I always look to integrate changes into the historic fabric with minimal loss and disruption.